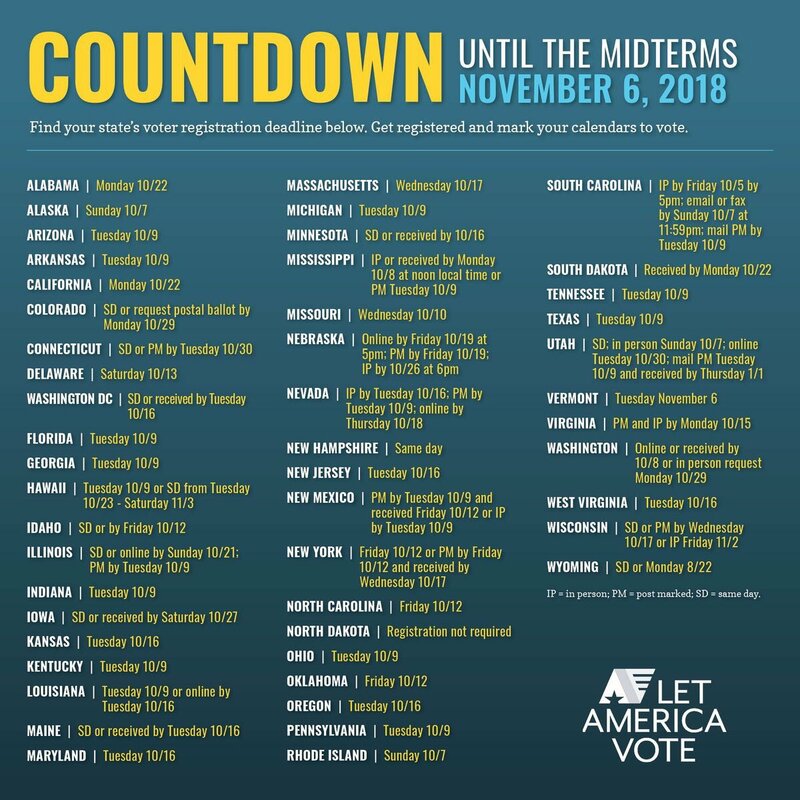 Use this table to check your voter registration or register to vote. Never give your full name, birthdate and address to any organization that does not make it perfectly clear how it will use your personal data AND that does not tell you how it will protect your data (its security measures). This table provides links to official state voter lookup. Registration deadlines follow. Alabama Am I registered to vote in Alabama? Alaska Am I registered to vote in Alaska? Arizona Am I registered to vote in Arizona? Arkansas Am I registered to vote in Arkansas? California Am I registered to vote in California? Colorado Am I registered to vote in Colorado? Connecticut Am I registered to vote in Connecticut? Delaware Am I registered to vote in Delaware? District of Columbia Am I registered to vote in the District of Columbia? Florida Am I registered to vote in Florida? Georgia Am I registered to vote in Georgia? Hawaii Am I registered to vote in Hawaii? Idaho Am I registered to vote in Idaho? Illinois Am I registered to vote in Illinois? Indiana Am I registered to vote in Indiana? Iowa Am I registered to vote in Iowa? Kansas Am I registered to vote in Kansas? Kentucky Am I registered to vote in Kentucky? Louisiana Am I registered to vote in Louisiana? Maine Am I registered to vote in Maine? Maryland Am I registered to vote in Maryland? Massachusetts Am I registered to vote in Massachusetts? Michigan Am I registered to vote in Michigan? Minnesota Am I registered to vote in Minnesota? Mississippi Am I registered to vote in Mississippi? Missouri Am I registered to vote in Missouri? Montana Am I registered to vote in Montana? Nebraska Am I registered to vote in Nebraska? Nevada Am I registered to vote in Nevada? New Hampshire Am I registered to vote in New Hampshire? New Jersey Am I registered to vote in New Jersey? New Mexico Am I registered to vote in New Mexico? New York Am I registered to vote in New York? North Carolina Am I registered to vote in North Carolina? North Dakota Am I registered to vote in North Dakota? Ohio Am I registered to vote in Ohio? Oklahoma Am I registered to vote in Oklahoma? Oregon Am I registered to vote in Oregon? Pennsylvania Am I registered to vote in Pennsylvania? Rhode Island Am I registered to vote in Rhode Island? South Carolina Am I registered to vote in South Carolina? South Dakota Am I registered to vote in South Dakota? Tennessee Am I registered to vote in Tennessee? Texas Am I registered to vote in Texas? Utah Am I registered to vote in Utah? Vermont Am I registered to vote in Vermont? Virginia Am I registered to vote in Virginia? Washington Am I registered to vote in Washington? West Virginia Am I registered to vote in West Virginia? Wisconsin Am I registered to vote in Wisconsin? Wyoming Am I registered to vote in Wyoming? Today I helped 7 family members to register and will personally drive them to the polls on Nov 6th.